Lightning results in 51 deaths per year in the U.S. on average, but did you know there are 5 different ways to get struck by nature's hottest phenomenon?At 50,000 degrees Fahrenheit, any cloud to ground lightning strike is a threat to human life and should not be taken lightly. In fact, lightning can be fatal from a strike that hit the ground up to 100 feet away, or originated from a thunderstorm several miles away. Let's examine the 5 ways lightning can strike a human. The first and deadliest way is by a "direct strike". This happens when a person essentially becomes part of the lightning discharge channel and typically occurs if a person is out in the open, unprotected. The next way to be struck by lightning is by a "side flash". This occurs when a taller object near the victim (such as a tree) is struck, and part of the current jumps to the victim. The next and most subtle method to be struck by lightning is through "ground currents". Though seemingly sublte, this accounts for the most fatalities as the lightning strikes an object and the energy travels outward along the ground. Ground currents can travel from objects such as metal poles and trees. The next way is by "conduction". 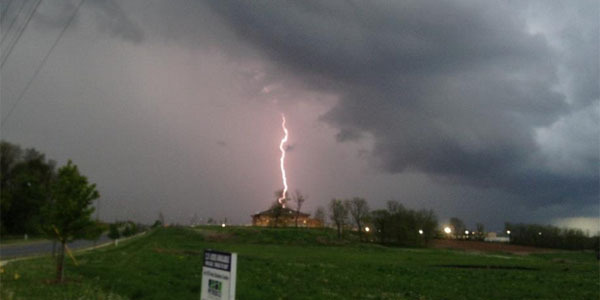 This is the cause for most indoor lightning injuries. In this method, lightning travels through wiring or plumbing that originates outside. This is why it is dangerous to be in the shower during a thunderstorm. The last and overall least common way to be struck by lightning is by a "streamer". This essentially is a strike extending from the main lightning bolt. While rare, it can still result in injury or death. So remember, when outdoors there is NO safe place to be as lightning does not have to directly strike you to be fatal. The only actual safe place to be is indoors (away from plumbing) or inside of a vehicle. Lightning deaths have thankfully decreased over the last few years. While still unfortunate, there were only 16 lightning related fatalities in 2017. According to the National Weather Service, this broke the previous low of 23 deaths in 2013. Lightning strike graphics courtesy of NOAA.